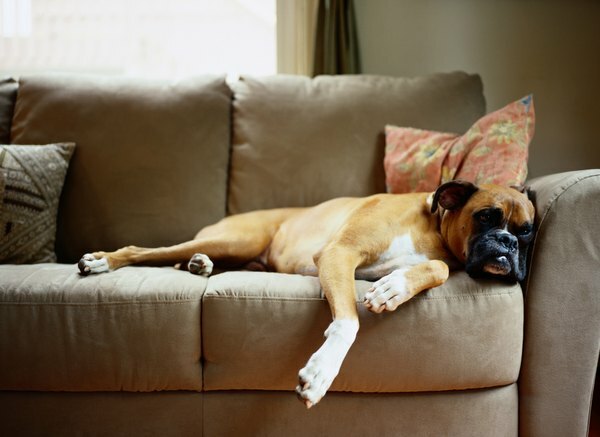 If you're tired of this, consider a DIY PVC D-O-G B-E-D.
A raised dog bed is comfortable, durable and easy to clean. Air circulates under the bed, keeping your pet cool during warm weather. You can easily replace the fabric when it becomes worn or to change the color or design. Weatherproof, a PVC pipe dog bed can serve indoors or outside. Cut the PVC pipe yourself, or have it cut to lengths at the hardware store, lumberyard or home center when you purchase it. Cut the PVC pipe into two 24-inch lengths, two 28-inch lengths and four 4-inch lengths, using a PVC/ABS handsaw. Connect one 24-inch PVC pipe and one 28-inch to a corner fitting. Attach a corner fitting to both open pipe ends. Connect the 24-inch pipe opposite the 24-inch pipe that's already in place. Using the last corner fitting, attach the remaining end pipe. Secure one 4-inch leg piece into each corner fitting. Place rubber tips on each leg end. Turn the frame over and firmly tap the top of each corner with a hammer, securing the legs. Place a 34.5-inch-by-38.5-inch piece of durable fabric upside down on the floor. Center the frame, upside down, on top of the fabric. Fold each fabric corner upward and inward, creating a V toward the fabric's center. The folded edge of the fabric should just reach across the center of the PVC corner piece. Make two half-inch folds along one long fabric side, working toward the frame, creating a hemmed edge. Stop when the folded edge reaches the bottom center of the PVC pipe. Using a drill driver, drive a screw through the fabric and into the PVC pipe, centering the screw lengthwise along the bottom edge. Drive eight more screws into the fabric and pipe, placing one screw at each fabric end, and placing each remaining screw about 5 inches apart. Working on the opposite frame side, fold the fabric toward the frame and drive in the center screw. Have a partner hold the finished side. Using tongue and groove pliers, turn the PVC pipe until the fabric is tightened securely. Drive in the remaining 8 screws while your partner holds the frame. Repeat steps 3 and 4 on the frame's short sides, using a total of seven screws on each side. Drive two screws through the bottom edges of each corner piece, securing one screw to the end of each side rail. Turn the bed upright. Drive five or six screws along the corner fabric edges, securing them to the corner pieces. The screws should be almost touching the fabric's edge. Attach the tongue and groove pliers to the PVC pipe, not the fabric, to avoid tearing the fabric. Stop drilling when the screw is flush with the PVC pipe to avoid stripping the screw hole. If the frame doesn't sit flat, place it on its side and gently twist the legs to reposition them. The finished size is 27.5 by 31.5 inches. This bed is large enough for a medium dog weighing up to approximately 60 pounds. You can adjust the lengths of each side rail to make a smaller or larger bed. Adjust the fabric size to fit the new dimensions.